No matter what the combination, whether it is a website or a blog or both, the below items are MUST have features of any cre website or blog! I am making this statement because I notice a trend of companies that have websites with a separate link to a blog. The website is treated like a separate entity from the blog and my MUST have features apply to ALL sites, not just blogs! These are my personal (no scientific evidence) findings based on visiting websites, social media sites, organization directories, license bureaus and other online sources pertaining to each and every single member and company on our site! In other words, we have visited thousands of these sites in our quest to Verify our members. 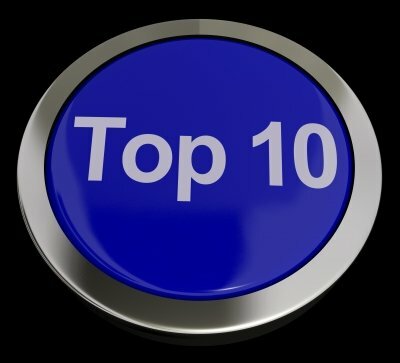 Here is my Top 10 Must Have Features and our members who are rocking them! When you click on the image, it will take you to our member page and the feature I like! Enjoy! Be sure you post whatever social media icons you utilize on your site. Facebook, YouTube, Twitter or Google+ page or even a tBL icon. No matter what, those links are the secret to the success of your traffic. Period. That is how you engage, interact and draw people in. They see your website or blog and they want more. More of you, more of your videos, more of what you are saying on Twitter, validate you are active and real. They want to know you have Likes, followers, circles, etal. Sorry to report that to you, but that is the name of the game. Your potential clients want to hire someone who knows how to market property and engage people, or create a community! It is all so transparent now. 2. Phone number to call a human being. Please, I beg, beg, beg you to add a phone number. I do not care if it is a free Google number, but please give people a phone number. 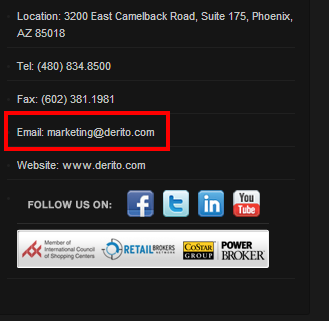 So many companies have a Contact Us page and when I get there and see a form, I want to cry. Do you really think I want to fill out a form? Do you like to fill out forms? I do not. I like to call people. Please add a phone number. Do not make me wait! 3. Use your own domain name email NOT free email like [email protected] on the site. So if you have a domain name you own that name. Adding a simple email address to your hosting account is so super easy and basic. You can also forward that email address to your free email account and still use your free email! Do not cut yourself short here. Use your own domain for your email. See me rolling my eyes on this one! 4. Display a company email for a general inquiry and be sure it is responded to quickly! If you have a domain name it is super easy to add an email address like info or marketing or something that can forward to you when someone emails your company. It is very professional and is a great indicator of your traffic and where that traffic is coming from. If you use [email protected] and get an email, you know they were a website visitor and they require immediate attention. You can also isolate that correspondence and track it much easier as website traffic. 5. Social media share tools, especially Twitter, Linkedin and Google+, on any content or pages you wish to be shared. If you write any content, story, press release, etc. you must enable your visitors to share it out via their social media. That is #1. If I read a great blog and want to share on Twitter, it drives me crazy when the blog owner has no share functionality. This is a major problem to me. Also, Linkedin, Twitter and Google+ are my favorites, although I do share to Facebook from time to time. Did I mention Linkedin? Yes, please add it, and do not overlook it. It is the most overlooked share site of all! Huge. Add it. 6. Display a URL, 3rd party source, be it tBL, CCIM, SIOR, AMO, ICSC or anything that links your profile to another source to validate you are actually in commercial real estate. So you have a bunch of logos on your site, but they do not link to your content at those other sites. 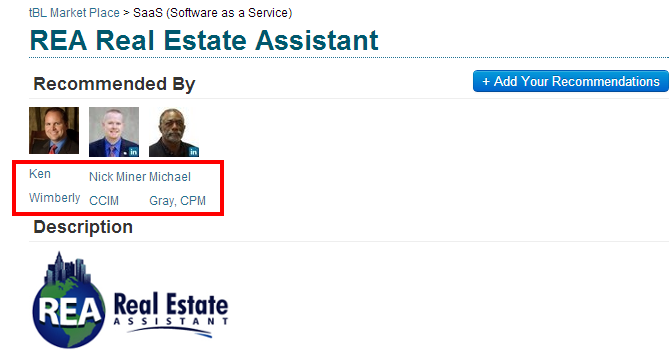 For example, if you have been Verified at theBrokerList, that is a big deal! Display the icon and link it to your profile. If you are an AMO or SIOR or any member of any organization, link it to show your listing on their directory or if Loopnet, please link to your properties. So many have a Loopnet logo, but no link back to their listings! Such a shame and waste of what the internet can do for you! 7. Add recommendations/testimonials with links to those testimonial sources. Let folks click through to see who the testimonial is from and give thanks back by linking to those who do help you! If you have testimonials, you are doing great. Now take those testimonials and hyperlink to those people or companies so they are shown to be credible and it also gives them a thank you in return. 8. 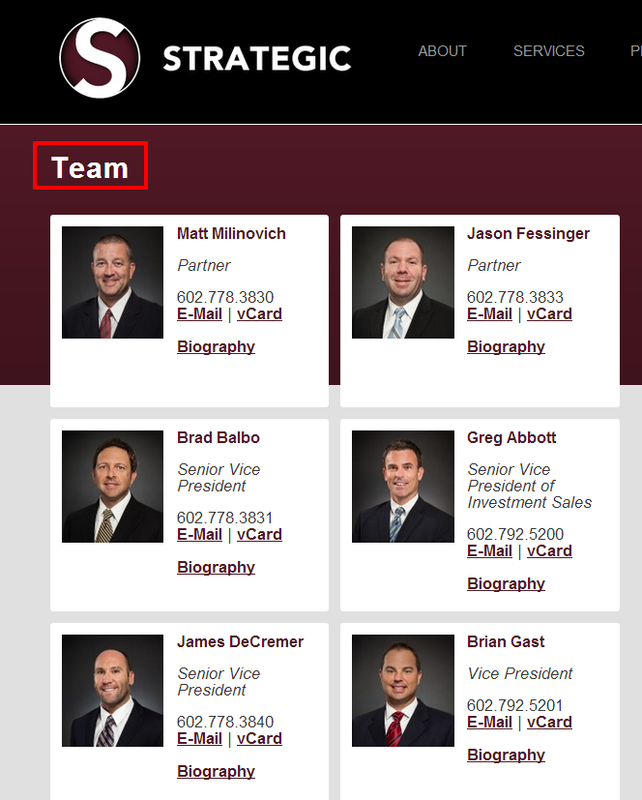 Team or Staff page to showcase your people. Our industry is only about people. If you do not want to show the world who you or your people are, what is the point of a website or blog. Do not just have a company and think that is all you need to promote. People are the product so you must show your team and staff or if you are a sole proprietor, show your own bio or profile. 9. Provide some client intake form or how can we help you functionality. What call to action do you want from your visitor? Do you want to help them? Ask them questions? 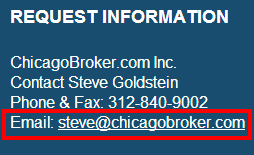 Get their name and email address? If you go to all of the trouble to get them to visit your site, please help them or give them some way to get help. Our favorite tool for this is Olark! 10. 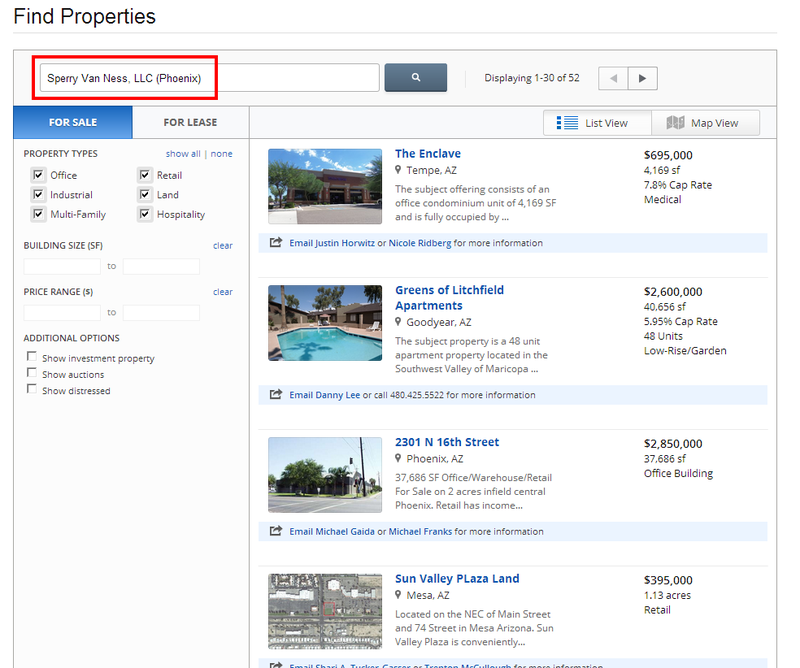 Display the listings you represent on your website and blog. Our world is about marketing so make sure you display your properties where people will find your content. Sounds obvious, but there have been sites that do not have a nice crisp and easy to find page of their listings or managed or leased properties. If you are in commercial real esate, you must show me stuff that you have a relationship with, whether selling, leasing or managing. Please display your properties! 10 a. 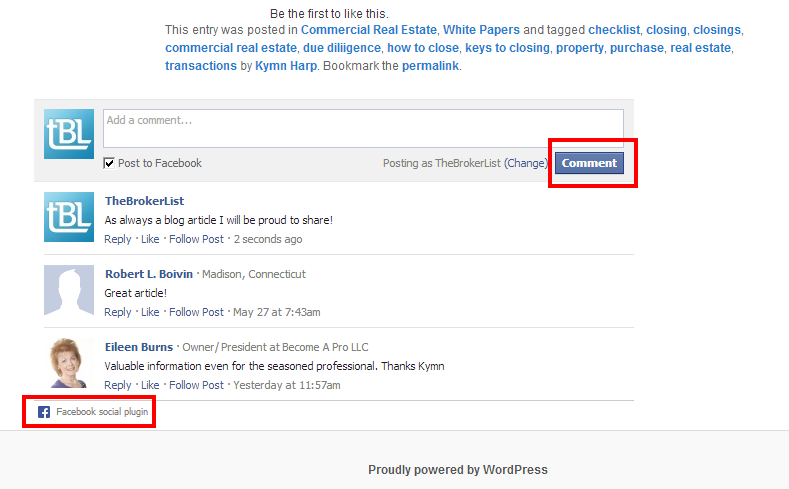 Use an easy comment systems like Facebook Social Plugin or Disqus or any comment feature on your blog posts! For those of us who read and follow blogs, it is the most frustrating of all things to me when I cannot comment or comments are closed on a blog. You need to make your blog posts interactive. You can install a myriad of comment tools. Try different tools to see what works best with your audience. I happen to like Disqus, but Facebook is also good as almost everyone in the universe has Facebook and they can easily leave a comment! REMEMBER: If you want people to leave a comment, make it easy. Do not put us through hoops to do so. Try your own site and see if it is user-friendly to leave a comment! My point is to change your comment system until you find something that works. Now that you know my top 10 Must Have Features, please make time to go back to your sites and make these changes. If you do not know how or do not understand, just ask. We are a community of many who have been there, done that. Also, just Google it! It is so easy to solve these issues and they are all FREE. Thank you Diane and thanks for reading, much appreciated!! !